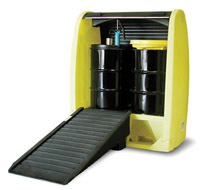 Easily load drum onto Poly-SpillPallets with the Poly-Ramp. Easily load drums onto Poly-SpillPallets with the Poly-Ramp. Poly-Ramp works with 12" Enpac pallets. Poly-Ramp has a ribbed, non-skid surface for safe walk-ups. 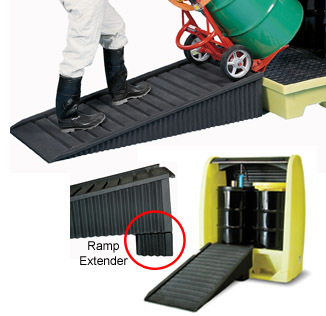 Ramp Extender works with the Poly-Ramp to accommodate 17" high pallets and 2-Drum Hardcover. Shipping rates are estimates only and do not include fuel surchages that change daily. Actual rate may vary.